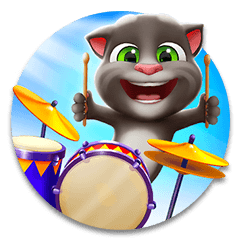 Outfit7 Limited, the creator of Talking Tom and Friends, is a family entertainment company and a pioneer in the field of digital entertainment. Your new best friend is here! 🔥FLY HIGH in Talking Tom Gold Run! Hi, guys! I’m Tom. You’ve probably heard of me, right? I’m the leader of the gang. The alpha cat. The big kahuna! Our app studio is the first step on the road to fame, fortune, and… what’s another thing that begins with “F”? Oh, right – FUN! Hi there! I’m Angela. I’m not into tech like Tom and the guys – I’m a singer and one day I’m going to be a big star! But I love hanging out with the guys, even if they do drive me up the wall from time to time! There’s only so much crazy a girl can take, after all! Oh hi there! My name’s Hank. I’m Tom’s trainee (and his super cool roommate) and the couch in front of the TV is my domain. Also, I’m basically the brains of the operation. No, really – I am! Hey! Stop laughing! BOO! Haha - made you jump! Tom and the gang (the old folks) are okay, I guess. But I’m the future! You should remember my name – it’s Ginger – because one day I’m gonna rule the WHOLE WORLD. All of it! But right now, I want some candy. I’m Ben. I’m a genius. Blunt, yes, but true! I do have hidden depths though. I’m a very funny guy, for example. Although, to be fair, I haven’t actually received external confirmation of that yet... So it’s just a hypothesis at the moment. But still! Funny AND smart.